From the last Boxtec Freaky Friday, I brought home a purchase I was particularly eager to unwrap: The XBotMicro, a small, Swiss-made robotics platform. The XBotMicro comes fully assembled, with a set of jumper wires, a handful of plastic standoffs and screws, and a manual in passable, though not always entirely idiomatic, English. Motors and motor drivers built in, just require two microcontroller pins each side to drive. Front equipped with solid mechanical bumper sensors. LEDs for motors (green/red for forward/backward indicator) and bumpers. Built-in LiPo battery, reportedly good for 2 hours’ driving. Very simple charging circuit—if the + pin sees a 5V voltage, the battery gets charged, otherwise, the battery voltage gets applied to the + pin to drive the installed microcontroller. Easily accessible power switch—one would think this is a complete no-brainer, but some robotics platforms, e.g. the SparkFun ProtoSnap Minibot Kit, require removing the battery to stop the motors. Separate motor switch: This is a really clever feature allowing a dry run of the programming by observing the LEDs, without powering the motors. The battery comes pre-charged, and the manual contains a sketch to make the XBotMicro drive forward without needing a controller (although the included jumper wires are too short to implement this sketch). Naturally, for any nontrivial task, one would want to install a microcontroller. At first glance, I thought that pretty much any Arduino board would do—the XBotMicro certainly looks mechanically compatible with them. However, the devil is in the details: When operating in battery mode, the microcontroller has the LiPo battery, typically about 3.7V, available. 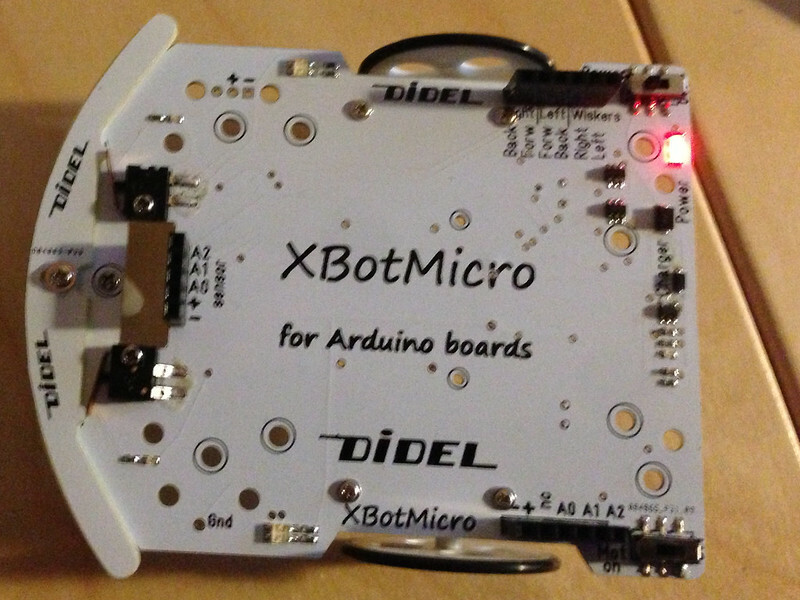 The manufacturer of the XBotMicro makes the Diduino, a rather neat Arduino clone with a built in breadboard. While the Diduino works with 5V, it does not have a built-in voltage regulator, which makes it unsuited to input voltages greater than 6V, but gives it much more flexibility toward LOW input voltages, so the Diduino would work well with the XBotMicro. There are also a variety of 3.3V based Arduino boards, most of which should also work. Update: It’s been pointed out to me that 5V Arduino boards should also work, as long as the input voltage is applied to the 5V pin, not the VIN pin, thus bypassing the voltage regulator. However, none of the Arduino boards I currently own are 3.3V based, so I had to think of another alternative. 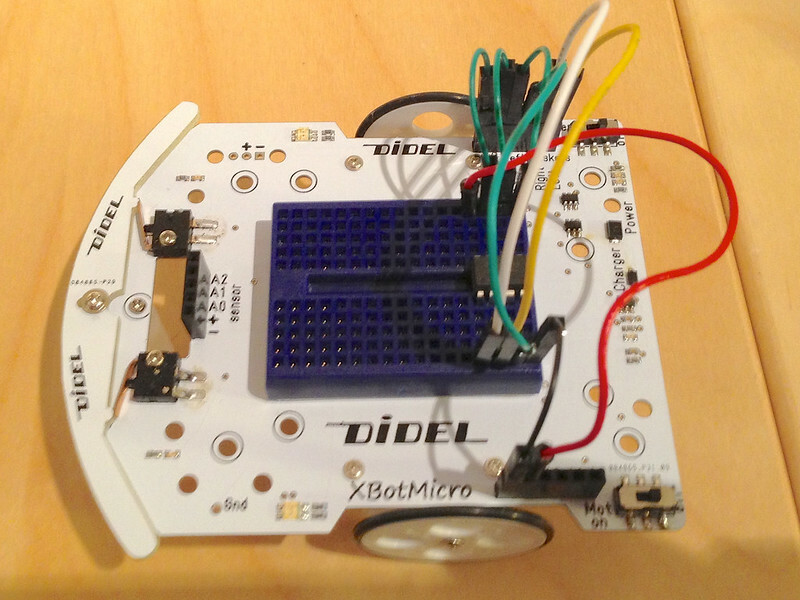 I ended up putting a self mini breadboard on the XBotMicro and installing an ATtiny84 on it. Since I already hard the Arduino-Tiny core installed, it was quite simple to adapt the demo code to the ATtiny84 and program it using ScratchMonkey. The breadboard has enough room to even implement a dual-ATtiny84 controller solution if I were to need more processing power. The language of the manual is not always 100% clear, and there are some typos. I was a bit confused about the A0/A1/A2 pins, initially thinking they were alternate pins for the bumper sensors. The schematics in the documentation are not very clear on that point either. The included jumper wires are very short; perfectly sized if an Arduino board is installed on top, but not very flexible for other pinouts. The demo code is written in French and is structured a bit awkwardly. I’ve taken the liberty of merging it into a single file and translating it into English. Here’s my version of the demo code, with pinouts for ATtiny84 and ATtiny85 added (in fact, the code is less than 2K, so you could save a few more cents and run this on an ATtiny25, but I didn’t have any at hand).